Based on true events, the film is an adaptation of Puenzo’s own novel, which follows notorious Nazi physician Josef Mengele. Lucía Puenzo's films tend to be very precise when it comes to their locations, “I couldn't imagine myself living anywhere other than Buenos Aires," she explained to us as we discussed her latest film, The German Doctor during her recent visit to New York City. “I like specifics," she continued, “knowing the names of the streets and places where my stories occur", something that can be perceived in the way her camera takes in the vastness of the Patagonia where her film takes place. Set in 1960 the film follows notorious Nazi physician Josef Mengele (Àlex Brendemühl) who has adopted a new identity and lives in hiding among unsuspecting citizens. He moves into a local hotel where he befriends the couple who run it, Eva (Natalia Oreiro) and Enzo (Diego Peretti). He becomes particularly interested in their young daughter Lilith (Florencia Bado), who has a growth defect. He decides to resume his genetics research and try to fix her, as a resourceful spy (Elena Roger) gets closer to finding his true identity. Based on true events, the film itself is an adaptation of Puenzo's own novel, originally titled Wakolda (set to be published in English in May) and it explores themes that permeate Puenzo's entire filmography. As in the intersex coming-of-age story XXY and the lovers-on-the-run drama of The Fish Child, the filmmaker depicts young women trying to discover their own identities under extraordinary circumstances. Puenzo talked to us about what is it that keeps drawing her to these themes, discussed her writing process and also shared her passion for genre. You have said many times that you think of yourself first as a writer and then as a filmmaker. Can you elaborate on that moment after you've written a novel, when you decide to turn it into a film? It's never been premeditated, but it's happened many times in the past. My first film, XXY was based on a short story by my partner, Sergio Bizzio, which I read while he wrote it and I told him I wanted to turn it into a film. He said you can have it, as long as you do something completely different with it. I found that experiment to be lots of fun and I enjoy adapting because it means creating something different out of something that already exists. Then came The Fish Child, which proved to be quite interesting because the narrator in the book is a dog, and the novel overall has a very dark sense of humor. The movie however has no humor, it's a heavy, noir drama. Similarly in The German Doctor, the novel doesn't have Mengele's point of view per se, but it's narrated by a fanatic, by someone who thinks of the world as a big laboratory, trying to dissect everything. When I wrote the screenplay however I was interested in the girl. Literature to me is like microscopic writing, it takes me six or seven hours to write a page and a half; however once I'm done with those, I usually never do any rewrites. I write a little bit every day and like getting lost in the story. I don't like having outlines because once I know what's happening next I end up not writing it, part of the fun is not knowing. Cinema has a different structure. When you're adapting literature into a screenplay, are you usually more critical with your own work? Yes, to some degree. I thought adapting my own work would be easier. Even if you know your characters inside out, you tend to be more condescending with yourself. There are many things I tried not to kill in draft after draft, only because I liked them. I think it's a longer process. So you also allow your actors to develop their characters from the screenplay without knowing the source material? Yes. Everyone in The German Doctor asked me if they should read the novel and I said “it's your choice". You have to be very careful with actors, sometimes even showing them daily rushes can be tricky because they see themselves and get scared. You don't want your actors to see more than they should. The German Doctor takes place shortly after the Perón years in Argentina and you cast Elena Roger, who played Eva Perón on Broadway, as a spy. Is there some inside joke in this? (Laughs) No, not at all. I love Elena, I was trying to find an actress with a small frame so she could approach Lilith and Elena is unique, because not only is she beautiful but she's also a great actress. At one point she was supposed to play the mother and Natalia was playing the spy, but then we cast Lilith and I realized she looked a lot like Natalia, so I asked her to learn German through phonetics - which she achieved in a month - and she played the mother. Does it take you very long to cast all your actors? Yes. For example we started casting for the part of Lilith seven months before shooting, we went to endless theater schools. I usually cast the children first and then the parents, because they're usually the most important characters in my stories and the rest of the cast has to fit them. So we cast Florencia first, then Àlex Brendemühl, who looks like the real life Mengele, and later came the parents. I like the families to look real. The character of Mengele is spookily charming. How did you achieve that? The first thing I discussed with Àlex Brendemühl was how to stay away from stereotypes. These men were psychopaths, very complex, perverse people, who escaped Nazi Germany and relocated and in a way put on these great performances. If you listen to stories about people who knew them, they all say they were charming fellas, which I find to be truly horrific. They were beasts hidden under the guises of good citizens, who remained hidden for decades. These men were hibernating all over the world, camouflaged like the plague described by Camus. The film clearly states that Mengele was a monster and we could also count on the audience's knowledge that this was a truly wicked man, so this is the only way we could make Mengele charming. Àlex said he wanted to go deep under his skin and wanted to understand him. How do you make a film that doesn't feel like it's delivering “a message"? The story is very intimate, it's four people stuck in a hotel, despite the historical context. I wouldn't know how to tell a story with a message, the very idea would paralyze me. The German Doctor explores themes very similar to those you dealt with in XXY, that is we have two girls with physical disorders whose lives are changed by strange doctors, what attracts you to these subjects? When I was writing The German Doctor I didn't even realize how similar it was to XXY, it was only after I published it that many people brought this up. Obviously now I can see those similarities, but I think many authors and filmmakers tend to revisit the same themes over and over during all of their life. They must be very deep obsessions that come out without you realizing it. So if we were to define your style, could we say that you're creating character studies filtered through elements of genre? I love genre films. Since writing a film and writing a book are such long processes, I have the idea that the author has to really like what he or she's doing, otherwise they won't make it to the end. I make films I'd like to watch. I've always been a fan of genre films, more so than auteur cinema, which I can watch because I'm a big cinephile, but I feel you can rely on genre and luckily young filmmakers are making genre movies again. For a while there was some resentment towards genre films and all they wanted to do were auteur pictures. I think genres are quite noble. 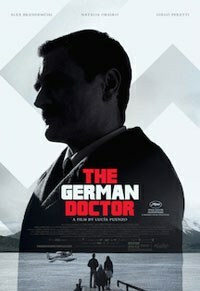 The German Doctor is now playing in limited release.